” ‘Duty, Honor, Country’ — those three hallowed words reverently dictate what you ought to be, what you can be, what you will be. They are your rallying point to build courage when courage seems to fail, to regain faith when there seems to be little cause for faith, to create hope when hope becomes forlorn.” — Gen. Douglas MacArthur, speaking at West Point on May 12, 1962. 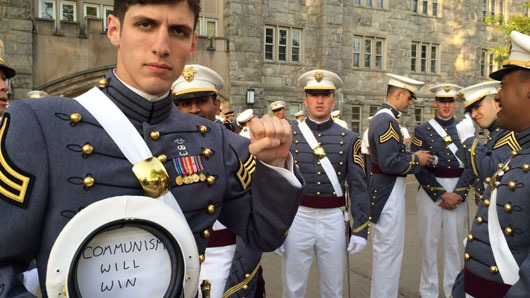 The politicization of the curriculum at West Point and the superintendent’s refusal to enforce the cadet Honor Code has led to a “malaise that pervades the entire institution,” retired Army Lt. Col. Robert Heffington said in an open letter to West Point graduates. Cadets refer to one American history course as the “I Hate America” course, Heffington wrote. Heffington told The Daily Caller he wrote the letter to the USMA Class of 1963 when several of its graduates contacted him asking how Second Lt. Spenser Rapone, a cadet espousing radically anti-American views, was allowed to graduate. Sen. Marco Rubio became aware of Rapone’s anti-American activism, calling the communist second lieutenant “a national security threat.” In a letter to Army Secretary Ryan McCarthy, Rubio asked for McCarthy to investigate if West Point administrators were aware of Rapone’s behavior, requesting a response within 30 days. “I cannot reconcile the image of a first class cadet at West Point with the things he has posted online for the world to see,” Heffington said. “To me, these are red flags that cannot be ignored, and I fail to see how this individual can possibly graduate and become a commissioned officer in six months. Heffington’s letter was posted on the website of American Military News.